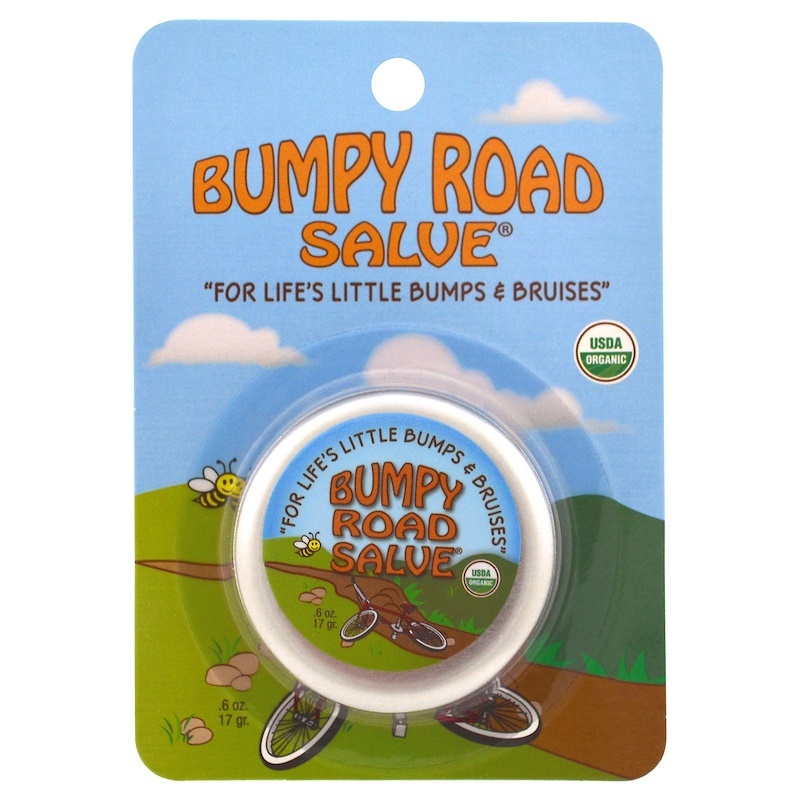 U. S. brand Sierra Bees presents Bumpy Road Salve. This is a 100% natural product formulated with certified organic ingredients that will become a real lifesaver whenever you have little bumps, bruises, scratches or other minor injuries, first-degree burns, or irritated skin. The salve is free of mineral oil, sulphates, preservatives, fragrances, dyes. Certified USDA Organic. Not tested on animals. The product is specifically designed to speed up the healing of little bumps and bruises. It relieves pain, reduces swelling and inflammation, and produces an antiseptic, antibacterial and soothing effect. Suitable for children. Key active ingredients contained in the salve are beeswax, extra virgin olive oil, sunflower oil, shea butter, comfrey, rosemary and arnica extracts, tea tree and lavender essential oils, and manuka honey from New Zealand. Herbal extracts and essential oils have a soothing and antiseptic effect, while beeswax and carrier oils protect the skin and keep it hydrated. Manuka honey has long been used in traditional medicine due to its antibacterial properties. pH balanced. Suitable for all skin types. Cruelty free. Directions. Apply liberally to bumps, bruises or irritated skin. Reapply as often as necessary. For external use only. Avoid contact with eyes. Discontinue if you experience skin sensitivity. Ingredients. Beeswax*, Extra Virgin Olive Oil*, Sunflower Oil*, Shea Butter*, Rosehip Oil*, Comfrey*, Arnica Extract*, Tocopherol (Non-GMO), Rosemary Extract*, Tea Tree Oil*, Lavender Essential Oil*, Manuka Honey*. Want to buy Bumpy Road Salvе? Call us or submit your order via our web site! My cat is really, really bad tempered (but I love him anyway, lol) so I often end up with scratches on my hands that sometimes get infected. Bumpy Road Salve always make the swelling go down real quick and I don't have to use antibiotic ointments anymore. I also apply it when I accidentally hit something to prevent bruises.